Topic: TNET: Duke head coach says Clemson might be "most complete team ever"
TNET: Duke head coach says Clemson might be "most complete team ever"
Duke head coach says Clemson might be "most complete team ever"
Don't take the cheese.They've won seven games. We give up about 10-15 yards a punt. We'd better off allowing Trevor to throw a Hail Mary on 4th downs than punt it - and trick the opposing team into catching it when they'd be better off dropping it. I'd also like our chances of a Tiger catching the ball to begin with! Sad not to have a kicking game. That may cost us big-time at some point. 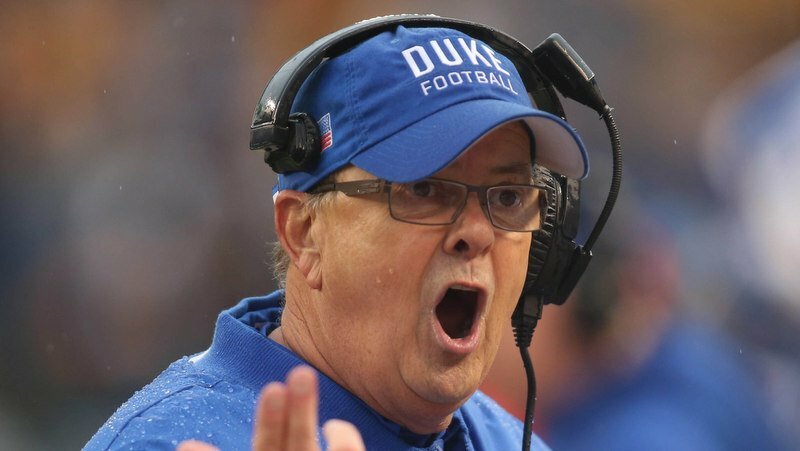 Re: TNET: Duke head coach says Clemson might be "most complete team ever"
David Cutcliffe is a Complimentary Genius! Fromunda where? ?? Please don't tell me *there*! ?? I would love to hear Coach Cutcliffe's thoughts on how Lawrence compares to where Manning was as a freshman. I think he is way ahead, but it would be cool to hear his analysis. Lawrence is way ahead of Peyton Manning as a freshman, at least as far as stats go. Tennessee had Todd Helton, who I believe was a senior, and highly touted freshman recruit from Stephenville, Texas named Branndon Stewart. Manning didn't start till later in the season and only threw for 1,141 yards and 11 touchdowns. Hey, I can remember when we ranked 6th in the nation, and Duke beat us like a drum. Let's take care of business, before we start talking about the playoffs. Looking ahead---good way to get beat. You know this is coach speak and not wanting bulletin board material. Because nothing about our kicking game ,punting, FGs and now even Kickoffs is good maybe Decent. That is just plain stupid----I will give you the fact that our punting game needs to improve, but other parts of your statement is stupid!!! Our kicking game is poor. We didn't play that well against an average BC team, and they had had lost three games! Who have we beaten?? "Bama" against BC?? Huh?? Four TD's minimum. I agree with Dabo: There's Alabama and the ROS (Rest of Us). Sad, but true. Considering the depth this team has, the comment may not be as far-fetched as it sounds to some. I don’t recall seeing a team with the talented, experienced, depth this team has. This is one thing that Dabo has done differently than other coaches. He has been patient enough to let the younger guys get experience. I think this is the last piece Dabo needed to be able to sustain the success of the program. Outside of the obvious impacts, it pays huge dividends in recruiting by demonstrating that anyone who can contribute to the success of the team will play. Until recently I’ve been concerned about how Dabo could continue the success he’s had, but I think he know has the last piece of the puzzle in place. Guess he one-upped BC's coach. So much sunshine being blown. As Dabo says. Don't take the rat cheese. Re: Guess he one-upped BC's coach. True, but I'm a glass is half full kind of guy. Honestly, I see it as coaches being aware of the monumental task in front of them, but realizing that Dabo has his team doing things the right way. I see it as genuine respect for the team, who they are, what they've done, and how they do it. Now, interpreting what Dabo has said, this is a football game and it doesn't matter what the opposing coach has said, Clemson is going to beat them down as hard as they can. Were I the opposing coach, I'd expect nothing less. Still, it's good to see programs show mutual respect off the field. It echoes what I try to teach the kids I coach, regardless of the sport - we will do anything within the rules to win the game, not even giving our opponents a chance to breathe, but we will do so with class and respect. I want to be the team about which everyone says, "If we are going to lose, best to lose to those guys." Unless you are a Carolina fan, I think opposing teams can say that about Clemson because they had a chance to compete against the very best and were treated with respect in the process. I'm pretty sure, he was referring to Amari Rodgers fielding kicks, when he referred to "the kicking game", but who knows. Clemson is on the ROY bus. "Most complete team ever??" I really can't accept that. I am a devoted CU fan, but cannot see our OL as anything than above average. We have a great QB, but he is is typically having to hurry his throws, even against below average teams. Wait until we line up against Alabama.Our only hope will be through the air, and fortunately we have a great QB. Still, there's Alabama and the ROS. (Rest of Us). I have to agree! Sorta tongue in cheek but not really. ?? This is not the Duke basketball coach i am assuming . Addazio last week said we were the most talented team he had ever seen and now Cutcliffe is saying this is the most talented team he has seen as his 30 + years as a head coach. This is just coach talk though. They want to make sure they leave no bulletin board material. I did watch the Duke QB say that they are confident they can score on anytime in the country and they expected to win. He did not sound convinced. Maybe he was just nervous giving the interview. I think Duke is a above average team and should be ranked in the bottom of the top 25. We need to get ahead of them and then pound them as they have a bad rush defense (ranked around 102 against the rush) and their second leading tackler at safety is out. If we bring our A game. we will kill them. However, we can't just roll over them with talent alone. We just need to keep playing championship level football.